This activity is to practice listening and perception. 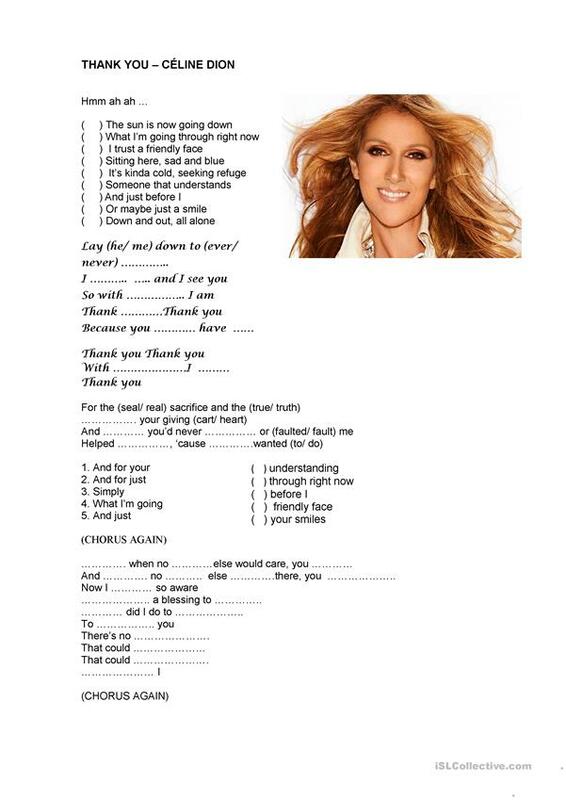 It is a Céline Dion's song, it's easy and very beautiful. You have to complete the song with the missing words, put sentences in order and circle the correct word according to the sound. This downloadable handout is meant for high school students, elementary school students and adults at Elementary (A1), Pre-intermediate (A2) and Intermediate (B1) level. It is useful for honing your groups' Listening, Reading and Writing skills. Rogers is from/lives in Brazil and has been a member of iSLCollective since 2013-03-30 01:24:34. Rogers last logged in on 2019-04-17 13:09:16, and has shared 1 resources on iSLCollective so far.